We are ranked as one of the nation’s top pediatric hospitals. Children's Healthcare of Atlanta is constantly striving to raise the bar in healthcare, and our efforts have not gone unnoticed. U.S. News & World Report has recognized our expertise and ranked us as one of the top pediatric hospitals in the country. We have earned The Joint Commission’s Gold Seal of Approval by upholding national standards for healthcare quality and safety. 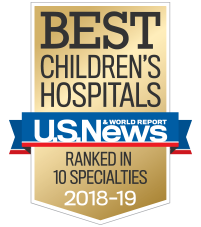 Children’s is ranked among the nation’s top pediatric hospitals in the U.S. News & World Report 2018-2019 edition of “Best Children's Hospitals.” Recognized as one of the most comprehensive listings of its kind, the report ranks hospitals for excellence in outcomes, program structure and national reputation in 10 pediatric specialty areas. Children's ranked in all 10 specialty areas measured. Learn more about our nationally recognized specialty programs. We are home to one of the nation’s largest childhood cancer centers and treat more than 400 new cancer patients each year. Children’s has one of the highest volume pediatric heart centers in the country. Our team cares for thousands of patients each year through our inpatient services at the Children's Sibley Heart Center and at Sibley Heart Center Cardiology locations across Georgia. Children’s endocrinology services provides complete therapeutic and medical care for children with adrenal disorders, calcium and bone disorders, growth disorders, diabetes and disorders of puberty and sexual development. Our gastroenterology, hepatology and nutrition program provides specialized care for infants, children and young adults with complex and common GI conditions including inflammatory bowel disease (Crohn’s disease and ulcerative colitis), swallowing disorders and reflux as well as liver and nutritional disorders. Children’s Neonatal Intensive Care Units (NICU) provide quality care for high-risk newborns in a specialized environment. Our NICUs have 77 NICU beds and are designed to deliver developmentally focused care specifically for newborns. Our NICU team includes approximately 400 specialists in 30 areas. Our dedicated nephrology team is experienced in caring for children and young adults with all types of kidney conditions—from the most common to those rarely seen outside of the top pediatric centers. We have one of the highest volumes of pediatric inpatient neurological and neurosurgical volumes in the country. As one of the largest and most comprehensive pediatric programs in the country, the orthopaedics team at Children's manages more than 156,000 outpatient visits each year across all specialties, from brachial plexus to sports medicine. Our pulmonology team consists of pulmonologists, nutritionists, respiratory care therapists and pharmacists. We care for children with respiratory problems, such as asthma, cystic fibrosis and pneumonia. Our urology program is nationally recognized for our commitment to clinical research and quality improvement. More than 4,000 pediatric urological surgeries are performed at Children’s each year. Atlanta Magazine recognized 96 Children’s physicians as Top Doctors of Atlanta in its July 2018 issue. Children’s physicians were listed in a number of specialty areas including allergy & immunology, cardiology, dermatology, gastroenterology, neurology, opthamology, orthopaedics and surgery, to name a few. The Atlanta Journal-Constitution named Children's as one of the top 10 places to work in Atlanta. The Atlanta Business Chronicle named Children's as one of Atlanta’s healthiest employers and one of the best places to work in Atlanta. Our professionals have also been recognized as part of their annual Health-Care Heroes awards. In 2016, Children's had two finalists and two Health-Care Hero Award winners. Fortune magazine has included Children's on its elite list of "100 Best Companies to Work For" for 14 consecutive years and counting. Working Mother magazine named Children's as one of the "100 Best Companies for Working Mothers" for 14 consecutive years.